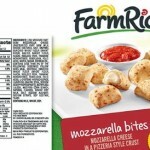 The government issued an expanded recall for Farm Rich products for E. coli O121 contamination yesterday. The retail distribution list was also expanded. Some of the recalled products are linked to an E. coli O121 outbreak that has sickened 24 people in 15 states. Seven have been hospitalized and one person developed hemolytic uremic syndrome, also known as HUS, a complication of Shiga toxin producing bacteria. According to the USDA update, public health officials think that some of these products are still in household freezers. More than 10 million pounds of food are now included in the recall. Please look at the updated list carefully to see if you have any of the products. If you do, do not eat them; discard in a sealed container or return to the place of purchase for a refund. A sample of a Farm Rich frozen chicken mini quesadilla product from a New York patient’s home tested positive for the outbreak strain of bacteria. In addition, a sample of leftover Farm Rich mini pepperoni pizza slices from a Texas patient’s home tested positive for the same strain. Ten cases in Michigan, Mississippi, New York, Ohio, Pennsylvania, Texas, and Virginia reported consuming Farm Rich products before they got sick. The retail distribution list for the recalled product has grown again. The products were sold nationwide, state-wide, or area-wide in these stores: Ralph’s, Safeway, Schnuck’s, Shaw’s, Smart and Final, Stewart’s Shops, Supervalu, Target, Thriftway, United Supermarkets, Von’s, Walmart, Wegman’s, Weis, and Winn DIxie. Please look at the list to see if the stores you patronize are included. If you ate these products and have been ill, please see your health care provider immediately and ask to be tested for E. coli O121.